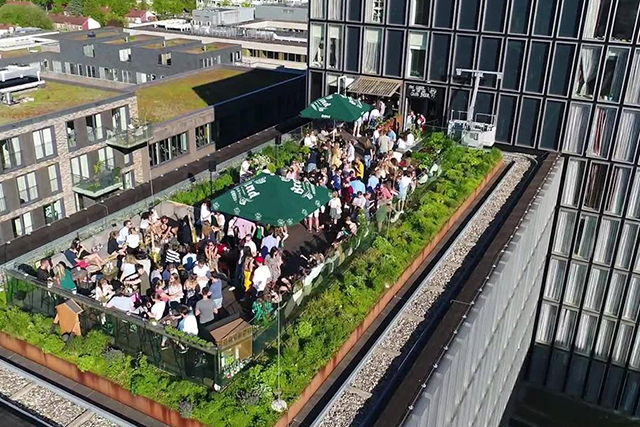 Best Rooftop bar Amsterdam: These Views Will Amaze You in 2019! As much as we love the charm of Amsterdam’s ‘brown’ cafés, sometimes dark wood and smoke-stained walls don’t quite cut it. 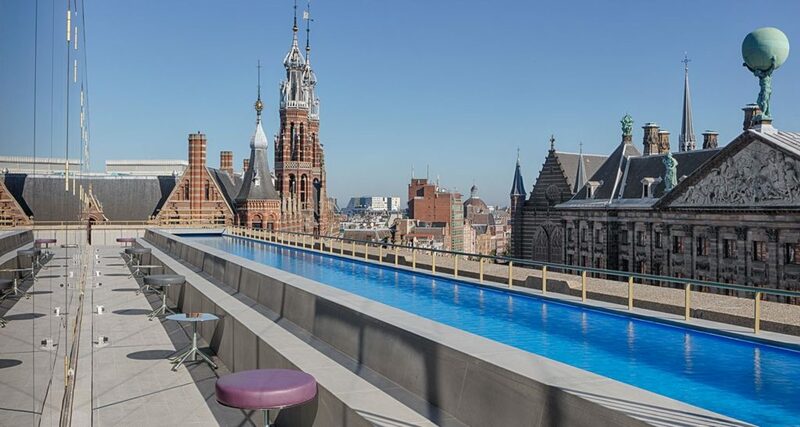 We welcome you to the 15 best rooftop bars in Amsterdam for cocktails, jaw-dropping views and maybe even a swim. There’s no better way to discover a city than from the sky. 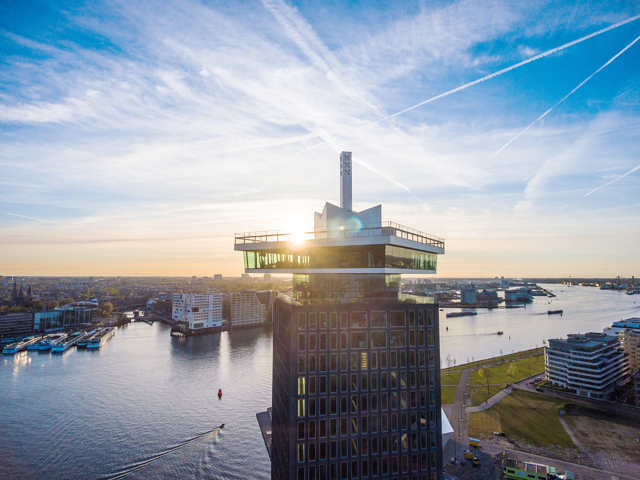 Take in the panoramic views over the city and over waterway ‘t IJ at Sky Lounge. This is an award-winning hotel bar on the 11th floor of the Hilton DoubleTree near Central Station. This is the place where the locals and the tourists come together. Why should you visit SkyLounge? This is the best place to be amazed by the panoramic view over Amsterdam, because SkyLounge was voted to be the best hotel bar of Amsterdam in 2017. It’s a wonderful place to eat and drink. Enjoy the cosmopolitan atmosphere and be surprised by the creative menu. They serve delicious cocktails, wines and appetizers. There is something for everyone to enjoy. In the evening, DJs shift the mood and SkyLounge transforms into an energetic nightclub, a great introduction to Amsterdam nightlife. In its previous life, Canvas at the Volkshotel was a lunchroom for the employees of Dutch newspaper De Volkskrant. In recent years, however, the establishment has been converted into an outstanding place, off the beaten path, where the locals meet, drink and party. Canvas is a place where you can come during the day or the night. Enjoy your breakfast here, or maybe have a beer in the afternoon. Or come visit in the evening to have a nice dinner and see all the lights of the city. 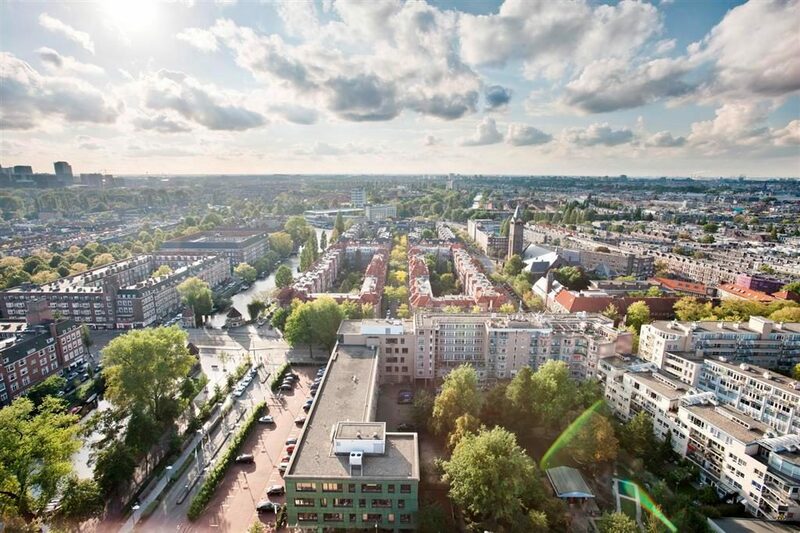 One way or another you will be stunned by the beautiful view over Amsterdam from the sixth floor of the Volkshotel. But Canvas is more than just a restaurant. On weekend nights it turns into a club. Move your feet on the dancefloor until sunrise. Crowning the 17-storey Ramada Apollo Amsterdam hotel, at 85 metres, Floor17 is one of the highest rooftop bars in Amsterdam. While a bit out of the centre, it offers the most breath taking view of the city. It doesn’t matter if it’s summer or winter, Floor17 is a wonderful place to be. Every Thursday, Friday and Saturday you can visit this place to enjoy cocktails and have a dance. At Floor17 they even organize rooftop movie nights. You can enjoy a good movie and a wonderful view at the same time. You will be extremely comfortable in one of the bean bags and with a drink in one hand and a snack in the other hand. This is the perfect night for a romantic get together. Floor 17 is also a great place to discover new style Dutch Cuisine. It’s a relaxed hotspot where you can hang out after a warm day in the city. The old Shell Tower has recently been transformed into the most creative place of Amsterdam. The 22-storey skyscraper is now a 24-hour hotspot that hosts a luxury boutique hotel, a revolving restaurant and a panoramic rooftop bar. Visit A’DAM Lookout. This is the observation deck. Here you will have an amazing view over the city. And if you’re up for a crazy experience you really have to try Over the Edge. This is Europe’s highest swing. You will swing over the edge of the building, 100 metres above the ground. This is the perfect experience for thrill seekers and adrenaline junkies. As the evening progresses, the dining area transforms to a sky bar. The buzz grows and a glamorous crowd hangs out in the highest 360-degree club in Amsterdam. Diners become clubbers. Dance to the music of established or upcoming DJs while drinking cocktails. 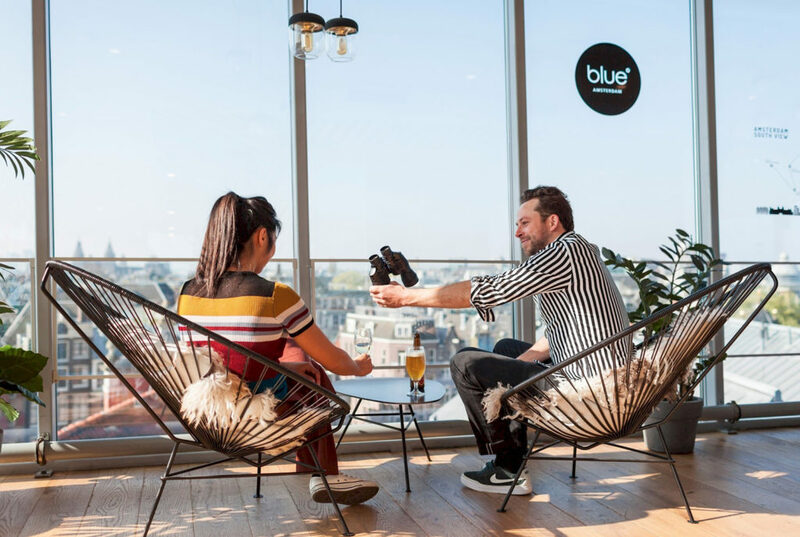 On top of the 5th floor of B. Amsterdam you’ll find Bureau. 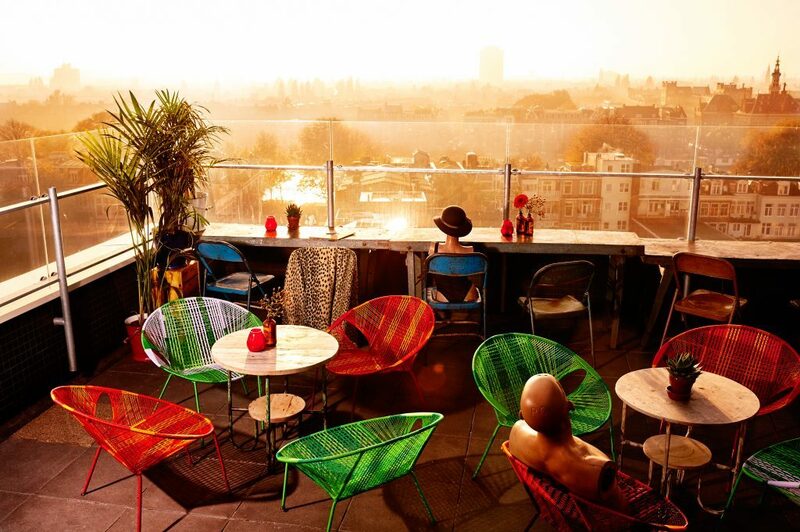 This restaurant is known as one of the most popular rooftop bars in the city. It even has a rooftop park. 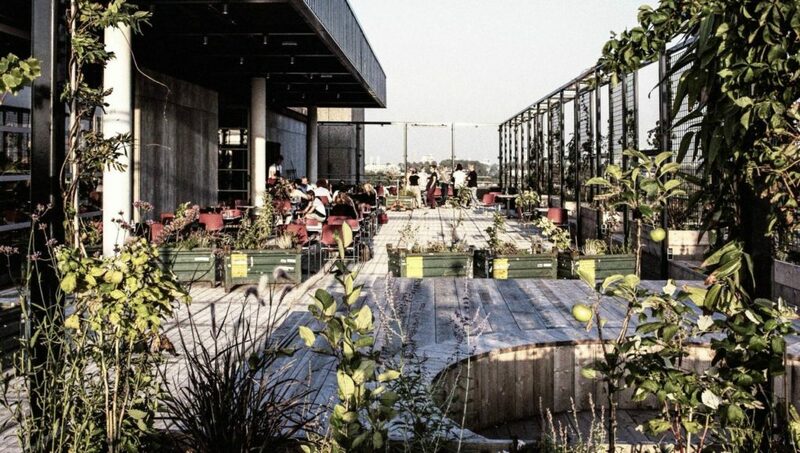 A rooftop park? What’s that? Well, it’s a garden and it provides fresh vegetables for the restaurant. It’s a lovely place to relax and enjoy the view over the city. This green place is the ideal location for a meet-up or a quick coffee. They also serve healthy lunches and delicious dinners. Everything that is served is homemade. Twenty Third Bar is a small, romantic and contemporary five-star champagne and cocktail bar located on the 23rd floor of Hotel Okura. From here you have some truly magnificent views over Amsterdam. Step by for a drink and to enjoy the extremely good foo. The delicacies on the menu of Twenty Three, such as caviar and oysters, are prepared by the chefs of the adjoining Michelin-starred restaurant Ciel Bleu. Sip on fruit-filled, Instagram-worthy cocktails, have a taste of the signature tapas ‘Open Macaron’ with goose liver and mango, and strike a pose with the city as a fairy tale background. It may lack the height of some of the other rooftop bars, but this sky lounge on top of the W Hotel is definitely one of the coolest. 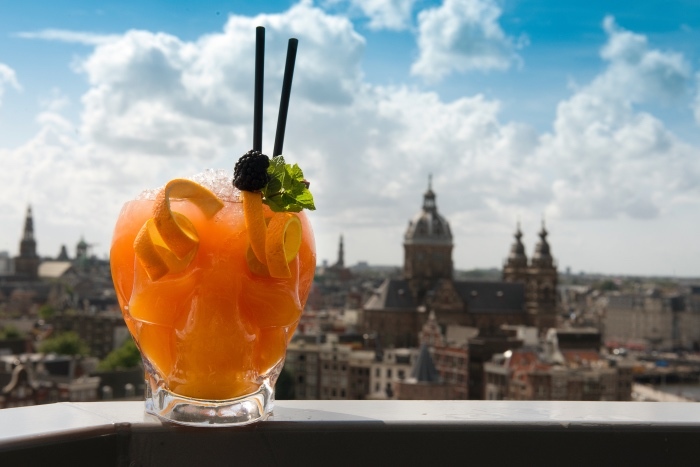 Guests are blown away by its incredible 360-degree views over Dam Square, the Royal Palace and Amsterdam’s city centre. There even is a pool! W Lounge is understandably popular with cocktail connoisseurs because everything that’s new and hot and happening in the world of mixology you’ll find here. You will also hear great music here, since W Lounge has its own music curator to compile the playlists. This is a wonderful place to be during the day, but the evening is when it gets really amazing. This is the perfect place to admire the sunset while sipping a tasty drink in the pool. The bar also hosts DJ performances and remains a popular after work hangout among the locals. The Nemo Science Museum is so much more than just a simple collection of exhibitions. This summer they have a special planning on top of the museum with their Nemo Roof. Combine your visit to the museum with a rooftop experience. It’s freely accessible to everyone via the stairs from the street or via the elevator in the entrance hall of NEMO. A perfect place to sit down and relax on a sunny day in Amsterdam. With a view of the historic city center it will show you a little of that Amsterdam magic we love. Blue is located at the centre of the city, in the Kalvertoren Shopping Center. The tower is thirty metres high and it is the perfect place to spot the Rijksmuseum, the Royal Palace and Amsterdam Central Station. This is a place with a laidback atmosphere, so it’s a nice place to relax for a while during your shopping spree. You can stop by for a nice cup of coffee or tea and some cake. Of course you can have breakfast or lunch here. They serve great sandwiches, soups and salads. This is also a great place for an early dinner. The restaurant is open seven days a week until 7.30 p.m.
Hopp is the rooftop terrace of Hotel Casa. It’s on the 7th floor and it’s called Hopp, since it’s the perfect place to hop to with your friends. What makes this rooftop terrace so special? Well, it is a rooftop beer garden. The owner of Hotel Casa wanted to bring something new to the city and he succeeded. This is a wonderful roof terrace where you can relax and have a nice beer. Since it is a beer garden, a lot of different beers are served. Of course you can have a bite to eat as well. The food is delicious. How about a sandwich or some pancakes? Most of the food is locally produced and most of the vegetables are grown in the rooftop garden. The atmosphere is really laidback, so if you really want to have a relaxing afternoon or evening, this is the place to be. If you don’t like beer, you don’t have to be afraid. They have coffee, tea, smoothies and lots of other drinks as well. Skyy Bar is a stylish and exclusive cocktail bar on the 9th floor of the Westcord Fashion Hotel. From the Skyy Bar you have an amazing view over the city. 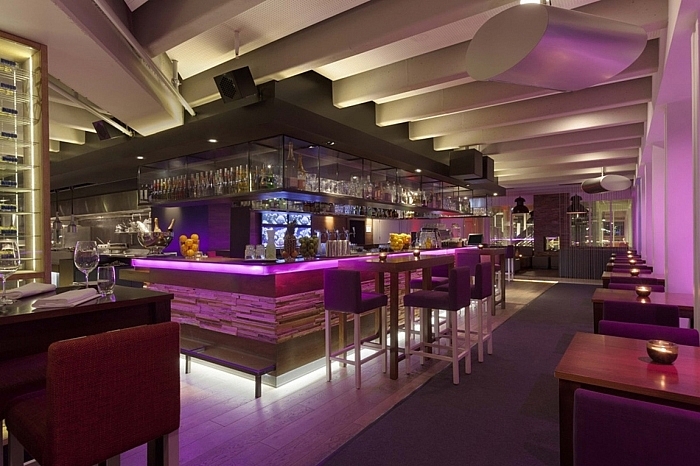 The atmosphere in the bar is great and the interior is modern and glamourous. This is the perfect spot to have drinks and dance the night away. Every Thursday, Friday and Saturday the DJs crank up the party with their music. Getting hungry during the night? You don’t have to leave, because they serve some great food here. How about a mini black angus burger or a croquette with a filling of smoked salmon? In the weekends Skyy Bar is open till 2 a.m. and the kitchen is open till 1 a.m.